Sultan n Madhu are silent on the phone..! Madhu asks about Aryan n Sultan says.. he is ok..! Aayan asks Sultan to ask Madhu how to remove gulaal before it becomes permanent .. n Madhu overhears n says.. apply Besan lep! Paddo-Trish are packing.. for Shirdi n Madhus cell rings n she is called to studio ..! Paddo-Trish oppose.. but Madhu says..she has to go to shoot..! Kaka feeding Aryan .. n Aryan shows how to eat Bheendi .. as taught by Madhu n Kaka n Sultan smile! Sultan gets flashback of Madhu .! Sultan asks Kaka to pack food n Aryan guesses they are going to Madhus place! Madhu arrives on the set.. its dark ..! She calls out ..if anyone is there? RK switches on light n says.. Tera ye puchna ke koi hai..aur mera ye kehna.. ke tu hi tu hai… main hi main hun ..ye shaam to soi hai… na aur koi hai..! Madhu tries to leave .. n RK shows her the memory from their meetings.. the piano .. the face [since he saw.. seeing moon is a waste of time] ..these eyes of Madhu .. n then two hearts full of poison met..n Madhu fell in his arms! RK recollects studio night n shows Madhu the swing from Karwachauth night! RK recollects the song… Baho ke Darmiya… duo dance..! RK asks Madhu if she thought about their first meeting ..how they would have met..! RK twirls Madhu …! RK asks Madhu if she had seen their future in their past? RK puts Madhus hand on his chest and his on her waist.. Rishbala close in for a kiss! Madhu pushes RK away ..n asks what he is doing? RK says.. making his wife.. his Madhu .. HIS OWN! Sultan-Aryan come to the chawl n Aryan is excited..n says..he bought chocolate/ cake for Madhu.! They notice the lock on Madhus door n ask around n get to know Madhu is on set! Sultan calls Madhu at Aryans behest ..n RK receives … n says.. Mumbai ka Sultan.. i m RK the superstar…Madhus hubby ..n will pass ur goodbyes to Madhu ..n dare not call my WIFE! RK tells Sultan that he did a favour on him by saving his life..so talking politely n tells him not to call again or he will shower curses ..on Sultan! Tells Sultan that he will tell Madhu there is nothing left to be heard anymore..! Aryan asks Sultan when Madhu will return n he says.. NEVER! Precap — RK tells Madhu that he is not proposing…taking what his own n tells Madhu she is his n tells her that she is coming n living with him…at his place.! Madhu resists but RK forcefully carries Madhu in his arms..! Madhu asks RK to give her the phone..n takes forcibly! She turns to leave and RK asks if Sultan calls her often? Madhu tells him ‘Hato mere raste se aur meri zindagi se bhi’! (Leave my way.. and my life too) RK asks Madhu if she din listen? She isnt going anywhere! Madhu says..she did..she heard every word of his madness… n remembers all the firsts…meeting.. falling in his arms.. dance..! Madhu says.. the film has changed..so things look different. .but what is in her heart has not changed.. ! Its still as broken as he had broken it to..! Madhu tells RK to see what she sees… the place where RK insulted her infront of all [removing the stole]! She shows a corner of studio n says.. the place where he made fun of their 4 phere ke wedding..! Another corner.. which RK wont forget ever. . the place from where the story of hate began [Madhu slapped RK] ..the story which he made his life.. n tried to make her destiny..! RK says.. if she keeps burning the past.. then they will both get burnt..! He asks her to forget all n Madhu says..for that she has to go away from him.. n forget him..! 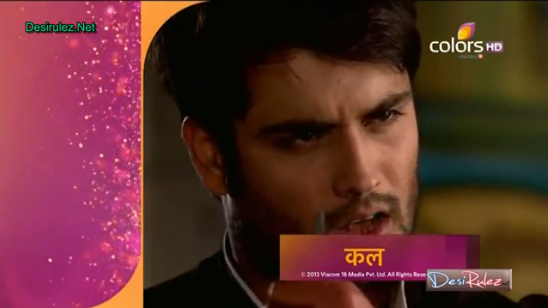 Madhu tells RK that his grand proposal to reunite..has only one answer from her.. NO .. NEVER! Madhu tells RK that there is nothing between them that RK can gain.. neither his Biwi.. nor his ishq.. nor his junoon..! Madhu turns to leave n RK pulls her back n pins to the piano n says.. he isnt proposing… he doesnt need to.. he is taking what is HIS… HIS OWN. .n she is HIS.. HIS OWN n she is coming with him..to his… their.. HER Home..! RK forces Madhu n Madhu resists ..! Finally RK forcibly carries Madhu outside the studio n into the car ! Madhu tells RK he has gone nuts n RK says..he was never normal..! RK locks Madhus car door and gets in the car… n says.. her anger.. her temper… the way of Jungli Billi out for a kill ..! He says.. kuch tum mera shikar karo. .kuch main tumhara! (You hunt me some, and I will hunt you some) RK puts Madhus seat belt n drives off..! Madhu tries to change gear n RK holds.. n says..he is the mirror of her dressing table.. which has seen her far more than she has seen him..! RK says.. what all she will hide? RK kisses Madhus hand..! Madhu falls quiet..! RK says.. he is carrying her away with so much love.. better give in! Madhu fumes..! Sultan-Aryan return home n Kaka asks back so soon? Aryan says.. Madhu was not there! Aryan asks Sultan what Madhu said? Sultan recollects RKs words.. ! Sultan tells Kaka to set the table! Aryan insists that he will eat with Madhu only..! Sultan walks off ..! Aryan decides to call Madhu .. Sultan comes n snatches the phone from Aryan..! He tells Aryan that in life what we want.. n what we get are different..! Likewise.. Aryan asked for Madhu ..but she is not with him..she is with her hubby…n he is all alone! Sultan asks Aryan to forget Madhu n move on in life..! Sultan says that if they keep still ..they will get hurt n get tired too..! Dips comes out n screams on Sikky if he cant set a proper ringtone? Sikky points to the door n Dips looks on..! Band people arrive and behind them RK comes with Madhu holding her hand ..! All are showering flowers on their path..! Sikky says.. this is RETURN of Bhabhi ji Part 2..! Madhu asks RK to leave her hand..! All stop playing the music..! RK asks ..why they stopped? His Biwi returned to her Home Sweet Home.. n asks them to play n they do! Madhu asks RK to stop it but he keeps holding her hand! Sikky tells Dips.. congratulations.. God heard him …this is complete family ..all have their own hubbies n wives..! Sikky showers money on the band people n dancing! Madhu asks RK to leave her hand ..but he doesnt..! Sikky is about to dance with Dips n RK says enough n says.. he felt Musical Happiness meeting them n now they can stop! RK asks Madhu to enter the house but she says..she wont..! Dips asks RK if he brought Madhu forcibly? RK ignores her n tells Madhu if she wont come ? Madhu says no..! RK says.. ok..wont force n leaves her hand..! Madhu turns to leave n RK pulls her back n carries her in his arm n Madhu asks him to leave her n RK says..there is a tradition .. that hubby carries wife inside her home.. so n tells Madhu not to put her feet on ground or they will run off! RK asks all to leave their path! Dips taunts him saying..dinno her words affect her so much..! Bittu comes n asks.. if RK brought Madhu forcibly? 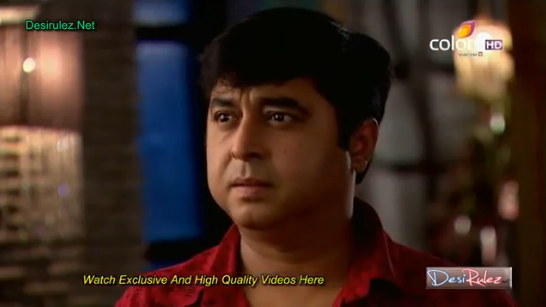 RK asks what happened to Bittu ji? Madhu turns to leave n Dips asks her where she is going? Wont she tell how she managed this ? Madhu says..better ask RK! Dips says..really? U din do! Madhu tries to leave n RK locks the door…! Madhu asks RK to let her go..RK refuses! RK declares all that the pride of this house.. Madhubala Kundra is back.. so everything will be like before.. let the house.. his room be set proper n drinks be thrown out.. as Biwi doesnt like..! He asks someone to get Mr India DVD as its his n his Biwis fave movie..! He tells all to lock windows n doors so Biwi doesnt disappear like Mrs. India! RK carries Madhu again n says.. to make Kabab for dinner …n ensure there is no Haddi in Kabab..else it will be thrown to dogs..! Dips fumes..! Madhu tells RK she wont go with him..! RK tells Madhu he is forcibly taking her.. ! Bittu asks what to tells City Times editor? RK says.. this isnt time to give bytes but if he needs better come to RKs bedroom! Sikky says.. he is Badtameez (arrogant)… but has style..! Dips fumes..! Madhu tells RK that he cant take her forcibly like this n asks him to leave her! RK puts Madhu down finally but keeps holding her hand! 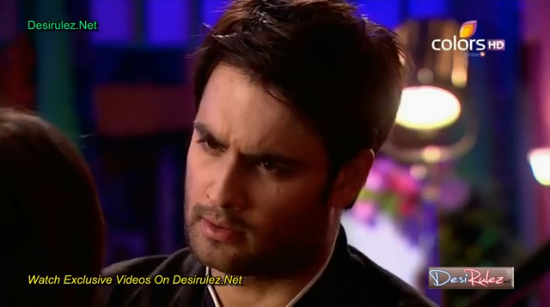 Bittu tells RK if he n Madhu will give a byte and if he will apologise? 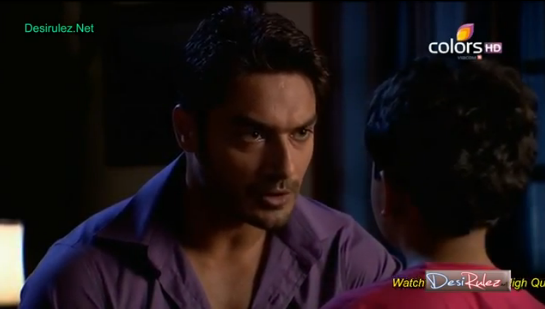 RK asks Bittu.. what sort of apology? Havent they had hubby-wifey tiffs? He says.. that this wasnt a fight.. it was a small tiff.. that has ended.. now..! Madhu is shocked..! A servant is setting the bed n RK says.. dare u touch n says OUT! Madhu sees the chance n runs off! RK screams. BIWI ..n fumes..! Precap — RK cuts his hand n MAdhu asks him not to and he asks…her if she still loves him? Tell me Madhubala Rishabh Kundra? Madhu screams YES … !